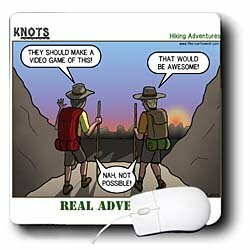 Knots Hiking Adventure - Real Adventure Mouse Pad is measuring 8w x 8h x .25d, soft commercial quality high resolution product. The image is permanent and becomes part of the mouse pad surface. Our transfer method produces professional matte finish with Premium Quality and Superior image resolution.